A delightful and engaging speaker, Howard immediately drew me into this creative and forward thinking talk. A simple Google search on Howard will net a myriad of interesting, innovative, unique, and inspiring ways of how he has applied the evolving tools of technology in his teaching and research. His is a human-centered approach and his holistic view point about technology,communication, and human interaction are what informs his practice. Howard describes himself as not being your “typical professor” as he views teaching as his own learning process and this teaching style, as he describes it, does not dictate that he separate himself from his students. 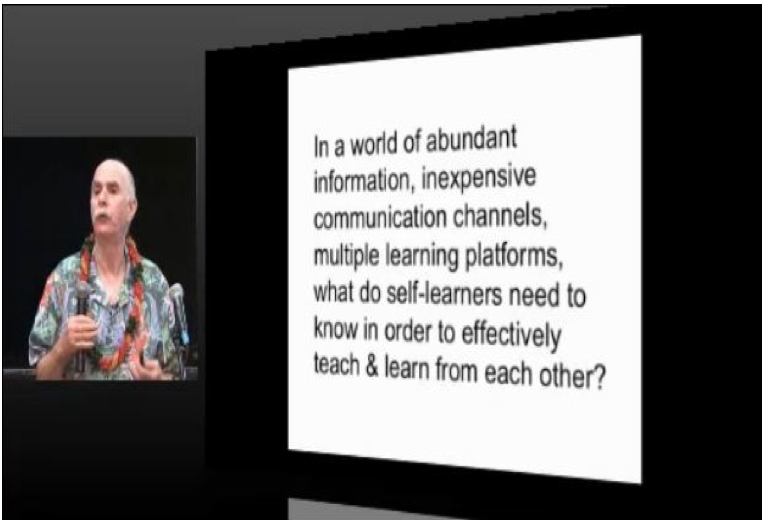 Howard believes learning can be an adventure and a discovery of new knowledge and he speaks about the “group voice” as the conceptual embodiment of the creation of an online classroom conversation. Educators like Howard are crucial to societal change as his viewpoints and teaching approach lend much to the work of shifting the paradigm of education to better fit 21st century society and the evolving variety of learner needs in today’s world. Perhaps the golden nugget of Howard’s talk is when he compares the move of rapidly evolving technology in education with the somewhat archaic unchanging pedagogy that still acts as the underlying framework in which this technology is applied. This creates a paradox in education and that is where Howard has chosen to apply his genius — at this intersection of new world learning and the rectification and redefinition of existing pedagogical framework. Howard reminds us that schooling is “political” and presents to us the possibility that teaching can be a subversive act in which we can act as a change agent in a system to further the purpose of fostering equality, knowledge, and freedom in an ever-changing world. This entry was posted in TCC 2015 and tagged #tcc2015. Bookmark the permalink.